With nearly 200 million monthly users – of which a staggering 83 million are paid subscribers – Spotify is one of the most popular music services in the world. It’s easy to understand why Spotify is so big. As a longtime paid subscriber, I have universally positive things to say about the streaming service. It has a huge music library, it’s easy to use, and it works with every device I operate daily – a Pixel 2 smartphone, a MacBook Air, and Sonos speakers. It even integrates into my PlayStation 4 and Xbox One. But there’s one function of Spotify that truly sold me on the service: The ability to upload music into my library on one device, and for that music to become available on most devices I own. Jay-Z’s album “4:44” isn’t available on Spotify, but I was able to buy it and add it to my local library. It’s available on my phone, or on my computer, or wherever else I want — seamlessly — through my Spotify account. 1. Uploading music to Spotify. The process of uploading music to Spotify is super simple. First, click on this little drop-down menu, right next to your username (seen above). From here, you can select “Add a Source,” which allows you to select whichever folders on your computer contain audio files. I’ve selected iTunes, Downloads, Music, and Local Music, which can then be toggled on and off depending on what I want to show up in my Spotify library. 2. Add local music to playlists, like you would any other music. 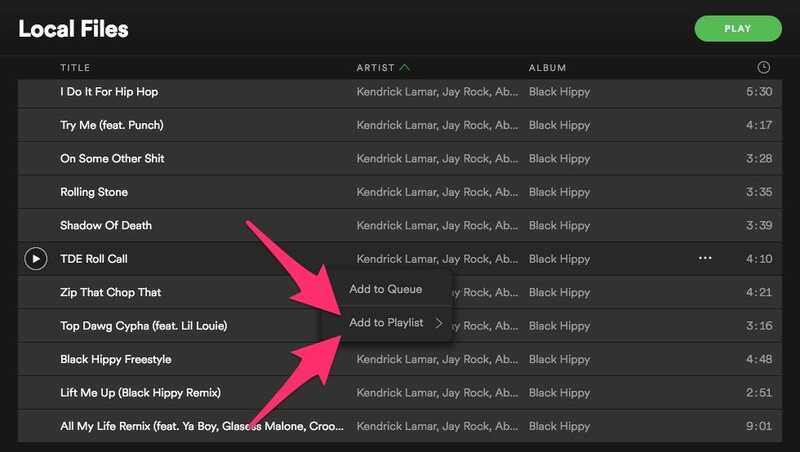 Once you’ve added various directories to Spotify on the desktop, it’s simply a measure of creating playlists so that you’re able to save those playlists for offline listening. You can add them to an existing playlist, or you can create a new one. Either way, get whatever tracks you want into a playlist (or several separate ones – you do you), and grab your phone/tablet/whatever device you want to save those tracks on. 3. Navigate to your playlists section, find and select the playlist you just made, and click the “Downloaded Songs” toggle. At this point, all you’ve got left to do is grab your favorite mobile device and download the playlist for offline listening. 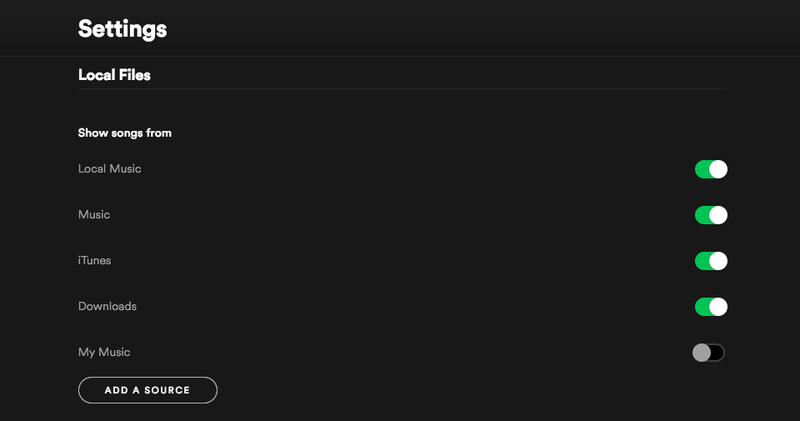 As you can see above, I’ve jumped to a smartphone where I’m logged in to the same paid Spotify account that I use on my computer. I’m connected to the same WiFi network as that computer, and … well, that’s pretty much it. I toggled the “Downloaded Songs” option, and that’s that – the playlist is now on my Pixel 2, ready whenever I want to hear it. You need a computer to upload files for offline listening on mobile devices. There’s unfortunately no getting around this requirement. The only way to upload music to Spotify is to do so through the desktop application, which is available on PC and Mac for free. It makes sense – you’re much more likely to have a music library on a computer, with a larger storage capacity, than a mobile device. But it still kinda stinks if you want to upload music that’s on your smartphone. An additional caveat: You must have a Premium (paid) subscription to upload music to Spotify. Given that you need a paid subscription to download music for offline listening, it stands to reason that you’re one of the 80+ million paying users. And one final caveat: Local files in Spotify playlists – saved for offline use or not – do not work with Sonos devices or other smart-home speakers, like your Amazon Echo. The songs will show up as unavailable. The ability to save songs offline in Spotify — including my own files — and to take them to nearly any device, is part of what keeps me loyal to Spotify. Being able to download music for offline listening is one of the tentpole features of Spotify’s paid “Premium” membership. It lets users save music to their phone (or computer, or tablet) directly, so it can be played without a data connection. It’s a crucial feature that’s kept me tied to Spotify, and it’s made far better by its ability to work with local files. My Spotify library is personal, full of mixtapes and purchased albums and plenty of normally available stuff. As someone who grew up owning CDs, who used to work in a Tower Records, I love the mobility and personalization of my saved playlists in Spotify. It’s like a digital CD book. That the function works so seamlessly with local files is a massive benefit, and I’m always surprised to find out that long-time Spotify Premium users didn’t even know they could do it.